Russian President Vladimir Putin told Ukraine's paralympic chief that politics and international afairs must not affect sports events such as the Paralympic Games that begin in the Russian city of Sochi on Friday, the Interfax news agency reported. Putin and Valeriy Sushkevich discussed "the fact that a sports celebration - all the more so one like the Paralympic Games - cannot and must not be under the influence of ... the international agenda or politics," Interfax quoted Kremlin spokesman Dmitry Peskov as saying.
.@OSCE military assessment group now approaching Crimean border at Chonar. According to a statement from the Foreign Ministry, Russia says the European Union has taken an 'extremely unconstructive' position by freezing talks on visa-free travel, Reuters reports. Russia says it 'will not accept the language of sanctions and threats,' and will respond if sanctions are imposed, according to Reuters. In the months since anti-government protesters took to the streets of Kiev, with Russian troops on the ground in Crimea and threatening to move into Ukraine’s eastern regions, some commentators have argued for partitioning Ukraine. This talk is not only simplistic but also dangerous. Ukraine is indeed a divided country with a contested national identity, but Ukrainians can’t be easily categorized. As international audiences scramble to understand Ukraine’s complex history, bloggers such as The Washington Post’s Max Fisher have been circulating maps that misleadingly present Ukraine as a country neatly split between a Ukrainian-speaking west and a Russian-speaking east. These maps offer the tantalizing suggestion that all we need to do is split Ukraine in half and many of its problems would fade away, as Sevastopol and Donetsk join Vladimir Putin’s new Eurasian Union while Lviv and Chernivtsi gravitate toward Europe. Even if we simplify matters by putting aside the country’s significant minority groups, which include Muslim Tatars, Jews and Orthodox Christian Armenians, there are really three Ukraines, and they overlap geographically to an extent that would make disentangling them a disaster. Russia now has 30,000 troops in Ukraine's Crimea region, Ukrainian border guards said on Friday, nearly twice the previous figure given by the government in Kiev. Serhiy Astakhov, aide to the head of border guards service, told Reuters the figure was an estimate and included both troops that had arrived since last week and Russia's Black Sea Fleet, permanently based in the Crimean port of Sevastopol. Russia, whose forces occupied the isolated peninsula last week, says the only troops it has there are those based in Sevastopol. The Russian troops that have occupied positions across Crimea wear no insignia on their uniforms but drive vehicles with Russian military plates. Ukraine says thousands of extra troops have arrived and have fanned out across the occupied peninsula in violation of the treaty governing the base. Earlier this week Ukraine said there were a total of 16,000 Russian troops in Crimea. The President spoke to Prime Minister Abe late last evening regarding the situation in Ukraine. The two leaders agreed that Russia’s actions are a threat to international peace and security and emphasized the importance of preserving Ukraine’s sovereignty and territorial integrity. They committed to work with other G-7 partners to insist that Russia abide by its obligations and commitments to Ukraine’s sovereignty, including under the UN Charter and the 1997 basing agreement, but noted that there is an opportunity for Russia to resolve the situation diplomatically, in a way that addresses its interests as well as those of Ukraine and the international community. Both leaders also agreed to work bilaterally and through the International Monetary Fund to support the government of Ukraine as it works to stabilize its economy and prepare for May elections. The President noted that his April visit to Japan will offer an important opportunity to advance the many diplomatic, defense, and trade initiatives the United States and Japan are pursuing in Asia and around the globe. According to Ukraine's Channel 5 TV, Ukraine border guards say 30,000 Russian troops are now on Ukrainian territory in Crimea, Reuters reports. Ukrainian opposition leader Yulian Tymoshenko sat down with Al Jazeera's John Hendren to discuss the crisis currently gripping her country. John Hendren: There is a very real chance, as you know well, that you could lose the Crimea. If that happened, what would that mean to the Ukraine and to the rest of the world? Yulia Tymoshenko: I think that today it is not just Ukraine that will lose Crimea. I think it is the whole world that, if it does not react to the situation, will actually lose stability. And I think all top leaders in the world should be aware of this. 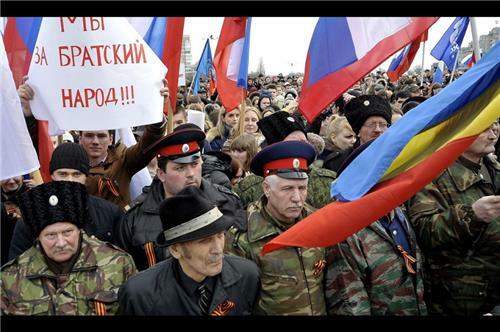 The Kremlin today has declared war — not on Crimea, not on Ukraine. But the Kremlin declared war on the whole world. If diplomacy doesn’t work, what would you like to see the world do? It seems diplomacy isn’t working now. The more time we lose, the bigger the risks that we face. Now there are proposals to create negotiations to resolve the situation at the highest possible level. But I think that any consultation or negotiation will not produce any significant results. Instead, they would lead to a situation where the March referendum on Crimea will be held and Ukraine will lose Crimea under the threat of armed force. Today, world leaders have to apply a completely different method. The critical date is the referendum to be conducted on Crimean secession. If the international community allows this referendum to be held then our struggle would be much more difficult. I call to all international leaders not to allow this referendum to be conducted and not to allow this brutal destabilization of the world. If key world leaders and the countries that promised us to protect Ukrainian territorial integrity when we gave up our nuclear arms would be willing to apply economic sanctions, then these sanctions should be of the highest severity. And these sanctions, like weapons, will destroy all the plans of the aggressor to capture the territory of the other country. If a real war starts in Crimea, if Putin starts a real war in Crimea and if he starts to take our territories for real, Ukrainians will fight to the death. A lot of blood will be shed. People will perish. They will give up their lives and if the world stays inactive then not only Putin, but the world will be to blame. As you point out this threatens to become an armed conflict. Is there any point at which you would ask the rest of the world to come in militarily? I cannot give advice to the countries that signed the Budapest memorandum with Ukraine, which led to Ukraine giving up its nuclear arms voluntarily. I cannot offer them advice. I am just asking them to honor their guarantees. When I say that more powerful instruments should be applied I don’t mean that a first shot should be heard. It must be like the Cuban Missile Crisis, when two superpowers clashed. But they ended the conflict peacefully and they kept the whole world quiet. I would call it peaceful greetings by powerful forces. And my opinion is that the containment strategy should be applied as soon as possible. If in the 21st century the Russian Federation in a peaceful Europe is allowed to capture a territory belonging to another European country by armed force, then I think the world will be in great danger. 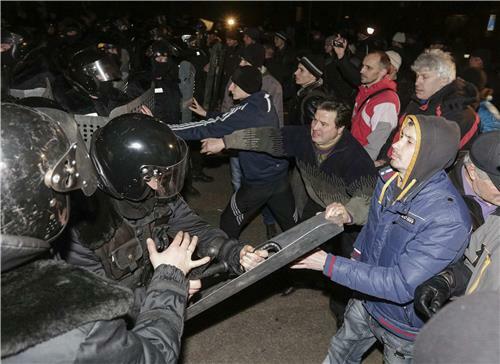 Ukraine's fledgling government is reaching out to oligarchs for help, according to The Associated Press. In a surprising move after Russia flexed its military might in the Crimean Peninsula, Ukraine's new leadership has reached out to oligarchs for help - appointing them as governors in eastern regions where loyalties to Moscow are strong. With their wealth, influence and self-interest in preventing further conflict, the oligarchs could be the key to calming tensions and maintaining Ukraine's control in areas where pro-Russian activists have stoked separatist tensions. But the decision to appoint the country's richest men as regional administrators has its risks. Some believe the oligarchs, who have a history of manipulating governments, may become too entrenched in their new jobs and could use their posts for personal gain. The unexpected move drew instant ire from Russian President Vladimir Putin, who called one of the oligarchs, Ukraine's third-richest man, Ihor Kolomoisky, a "swindler." "They name oligarchs, billionaires as governors of eastern regions," Putin said during a news conference earlier this week. "Naturally, people don't accept that." Under Ukrainian law, governors are appointed by the country's president instead of being elected. After President Viktor Yanukovych fled for Russia last month in the wake of mass protests against his government and deadly clashes with police, acting President Oleksandr Turchynov fired Yanukovych's appointees and replaced them with his own. RIA has the story on Russian parliament welcoming Crimea to leave Ukraine. Russia’s upper house of parliament said Friday it would welcome the addition of Crimea to the country's territory if residents there choose to secede from Ukraine in a referendum scheduled next week. Officials in the Crimean parliament – the Supreme Council – and the city council of Sevastopol voted Thursday for the majority ethnic Russian region to become part of Russia, amid increasing fears that Moscow was seeking to annex the Ukrainian territory. 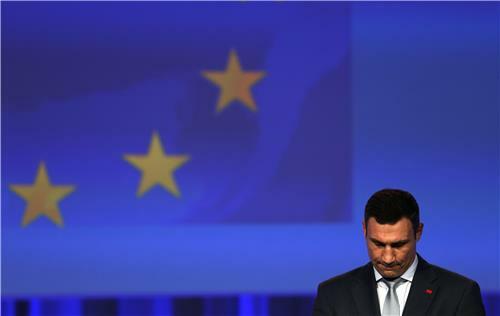 The votes by Crimean authorities, however, are not legally binding and have little immediate effect. “We [the Supreme Council] have made a decision on entry into the Russian Federation. Now the ball is in your court, you must decide the fate of Crimea – I hope, forever,” said Vladimir Konstantinov, chairman of Crimea’s Supreme Council, at a meeting of the region's officials with the speaker of Russia’s lower house of parliament Sergei Naryshkin. President Obama spoke for an hour with President Putin Thursday afternoon. Here's a readout of their call from the White House. President Obama emphasized that Russia’s actions are in violation of Ukraine’s sovereignty and territorial integrity, which has led us to take several steps in response, in coordination with our European partners. President Obama indicated that there is a way to resolve the situation diplomatically, which addresses the interests of Russia, the people of Ukraine, and the international community. As a part of that resolution, the governments of Ukraine and Russia would hold direct talks, facilitated by the international community; international monitors could ensure that the rights of all Ukrainians are protected, including ethnic Russians; Russian forces would return to their bases; and the international community would work together to support the Ukrainian people as they prepare for elections in May. President Obama indicated that Secretary Kerry would continue discussions with Foreign Minister Lavrov, the government of Ukraine, and other international partners in the days to come to advance those objectives. On Tuesday, former Secretary of State Hillary Clinton said that Russian President Vladimir Putin's efforts to protect Russians in Ukraine are reminiscent of "what Hitler did back in the '30s." Julia Ioffe, senior editor at The New Republic, joined Consider This host Antonio Mora on Wednesday to weigh in on the comparison and discuss Putin's style of leadership. 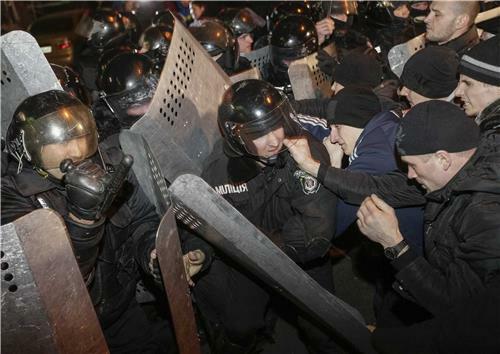 Pro-Russian demonstrators clash with riot police during a protest rally in Donetsk on March 6, 2014. Ukraine flew its flag over the government headquarters in the eastern city of Donetsk on Thursday and ejected pro-Moscow demonstrators that occupied it, ending a siege that Kiev had seen as part of a Russian plan to create a pretext to invade. The city council of Sevastopol in Crimea announced that there has been a vote to break away from Ukraine, our colleagues at Al Jazeera English have learned. The council said the vote is effective immediately. Earlier, the parliament of the Crimean region voted overwhelmingly to join Russia. House Appropriations Committee Chairman Hal Rogers gave this statement on the House floor Thursday in support of H.R. 4152, legislation to provide $1 billion in aid to Ukraine. Mr. Speaker, I am pleased to bring to the floor H.R. 4152, a bill providing the authority for loan guarantees for Ukraine. As we all know, Ukraine is facing an extraordinarily difficult time. As a valued partner and friend of the United States, our nation has a duty to provide the people of Ukraine with help when they most need it. This bill will provide some stability for the government and people of the Ukraine as they navigate through these troubled waters. The legislation before us will allow funds to be used to guarantee loans for the government of Ukraine – in support of the Secretary of State’s $1 billion pledge this week. This bill does not appropriate new funds, but simply allows funds to be used from within existing State Department resources. Ukraine’s economy has been in a difficult position for years, but now the country faces real risks. Russia has punished Ukraine for leaning toward the West and has suspended the assistance they planned to provide. This bill will not solve all of Ukraine’s problems, but it is an important first step that will allow the country to shore up its finances and begin to make its economy more efficient. With this legislation, Congress – and the United States – will show that we stand by those that oppose authoritarian rule. It will show that as a nation, we will step up to help the people of Ukraine not only with our words, but with action. Ukraine is facing an uncertain economic future, but they are choosing the right path of democracy and reform. The American people will stand with the Ukrainian people as they chart this new course, and today will take a first step to quickly respond to their present need. Mr. Speaker, this is a critically important bill, and one that should pass the House, the Senate, and be enacted without delay. I urge a “yes” vote. The US House voted 385-23 Thursday to pass a $1 billion loan guarantee to Ukraine. 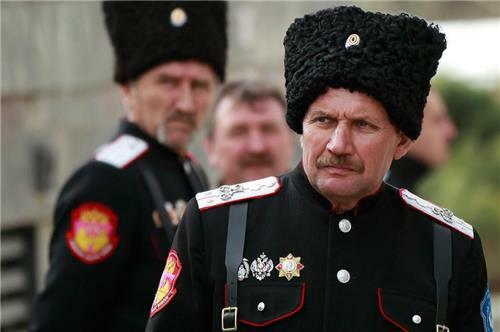 A rejuvenated Cossack "host" has emerged to support Russia in the contested peninsula. See more photos at Al Jazeera America. 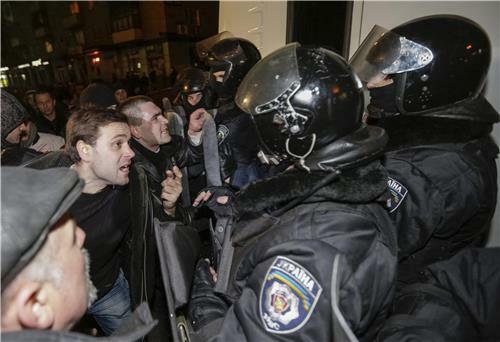 Carney called it unacceptable that UN envoy Serry was accosted in Ukraine on Wednesday. 'There's no question this is unacceptable. And it makes more urgent the need for Russia to pursue a diplomatic, peaceful resolution for this,' he said. 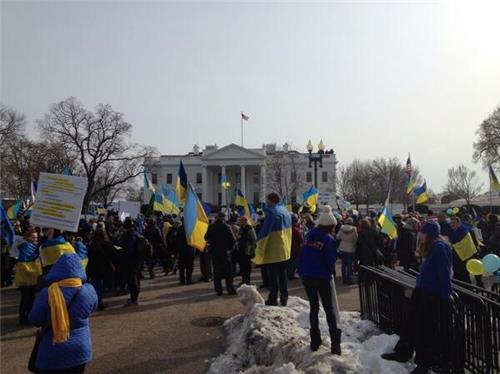 The Ukrainian Congress Committee of America is planning to hold a protest across the street from the White House Thursday afternoon. The UCCA is protesting the presence of Russian troops in Ukraine and see this as a sign of aggression in the region, according to Al Jazeera English. A reporter asks Kerry if he is "satisfied' with how the European Union is responding to this crisis in light of some apparent disagreement between Poland and other member states on how best to respond to what has happened in Ukraine. "The EU has been a partner in this, thoroughly," says Kerry. "I do not believe there is a gap. There may be some differences in opinion about timing...that's not unusual. But fundamentally, with respect to the need to protect the territorial integrity and sovereignty of Ukraine, there is no difference." A reporter asks Kerry if he feels "misled' by Russian Foreign Minister Lavrov. "We work professionally to represent out countries," says Kerry. "This is obviously a moment where we have disagreed, but where we can we try to find a way forward, whether it's with regards to chemical weapons in Syria or with the P5+1 on Iran." The Ukrainian government and parliament have conducted themselves professionally Carney said, adding that is important to protect the rights of ethnic Russians and all other ethnic minorities. Carney then blamed the tensions in Crimea on Russian military forces and those allied with them. Riffing off of Kerry's language on Ukrainian's right to "determine their political future", a reporter asks Secretary Kerry about "Crimea's future" in reference to this morning's referendum on Crimean independence. Kerry responds: "Crimea is part of Ukraine. Crimea is Ukraine...and referendum on Crimea is going to have to be consistent with Ukrainian law. All Ukrainians would have to be part to referendum with regards to the territory of Ukraine. Therefore, this proposal is in violation of Ukraine's constitution." Kerry says he has been in "very close touch" with European counterparts in Rome and Brussels. Partners agree there is an "imperative" to move quickly to enact measures to work towards a political solution. "The Ukrainian people, we are convinced, beyond any doubt whatsoever, want to determine their political future freely," says Kerry. "They have the international community's full support. We reserve the right to take the measures we have announced today, but our preference is to work together to bring normalcy to relations." "Crimea is a part of Ukraine," says Jay Carney. Sounds like we have a One Ukraine policy. 'Crimea is a part of Ukraine, the sovereign state of Ukraine,' Carney said unequivocally when asked about whether the White House is giving up region. Any decisions about Crimea has to be made by the Ukrainian government, he added. Do you have any sense Putin is getting your message, a reporter asked Carney Thursday afternoon. 'He certainly is,' Carney answered, saying he has no doubt Putin is clear about the United States' position. Kerry emphasizes that there's a reason why a general legal framework for sanctions has been put in place by President Obama and not specific measures. "We want to be able to have dialogue that leads to de-escalation," says Kerry. "We want to continue talks with both sides to normalize relations and end this crisis." 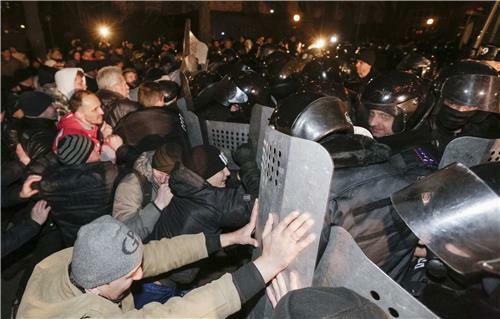 Kerry says he had "lengthy" discussions with Ukrainian officials. "With the Ukrainian view in mind, and the input of all of our allies in the European community, we've made recommendations to Russian Foreign Minister Lavrov which he is, I believe, taking personally to President Putin in Sochi." A reporter asked Carney if, in fact, the executive order actually escalates the crisis rather than de-escalates it. However, Carney said it does otherwise, giving the administration a tool to help handle the situation. While the administration announced the executive order, it is 'aggressively' pursuing a diplomatic solution, along with its allies, Carney said. Secretary Kerry is speaking now in Rome on the situation in Ukraine. No Russian individuals or entities are blocked pursuant to the executive order, Carney said, adding that it provides a flexible tool. Essentially, sanctions haven't yet been levied but the executive order paves the way for the administration to do so, according to Carney. When pushed on whether President Putin would be one of the people to be sanctioned in the future, Carney refused to answer, saying the executive order does not name or identify individuals or entities, it just provides a framework for levying such sanctions. But, when asked if he believes Putin is responsible for the current crisis, Carney said it is clear Russian forces are at the heart of the situation. When asked how many people could fall under the sanctions, Carney said he wasn't aware of a number. When asked if we were talking about hundreds or thousands of people, Carney demurred, saying once again that the executive order simply provides a flexible tool. Security Council to hold closed meeting on #Ukraine at 2:30 pm NY time today. Briefing from DSG Eliasson by video conference from Kiev. Carney repeated America's call that Russia allow international monitors into Crimea and Eastern Ukraine on a fact-finding mission.